Munters HCD series desiccant dehumidifiers are designed to efficiently dehumidify to low moisture levels. Process airflows are available form 300 to 12000 CFM. Unit casing is manufactured of fully welded, strain hardened aluminum to ensure zero air leakage. The electrical control system meets UL and NEC standards. The units are PLC controlled; all controls are mounted in a NEMA 4 control enclosure. Rugged construction makes these units suitable for outdoor or indoor mounting which provides the flexibility to install them at any location at your facility. 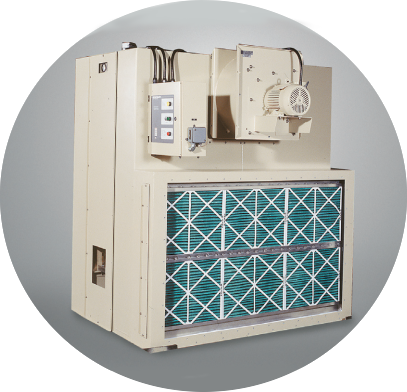 The HCD series includes all components and controls to operate as a stand alone dehumidifier. Many times an HCD dehumidifier is combined with other HVAC components like cooling and heating coils, filters or fans, etc. Pre-designed modules are available as part of our HCD plus product allowing Munters to provide you with a turnkey solution to your humidity and temperature control needs. Munters' HCD Plus add-on module provides additional process air filtration, cooling, heating and mixing functions that many end users require. The add-on modules integrate readily as "bolt-on" housings in line with the other process air components. The arrangement is skid-mounted, providing the buyer with a single source, factory-assembled package. It requires only utility hook-ups, chiller/boiler piping, ductwork connections and sensor- controller tie-ins on site. If a more complete system offering is required, with condensing unit, piping, integrated controls or other features, consult Munters representatives or staff early in the specification and design process for assistance in the equipment selection. Nominal airflow 1020 m³/h / 600 CFM. Nominal airflow 1910 m³/h / 1125 CFM. Nominal airflow 3,820 m³/h / 2,250 CFM. Nominal airflow 7,645 m³/h / 4,500 CFM. Nominal airflow 15,290 m³/h / 9,000 CFM.